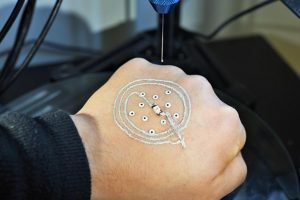 The idea for 3D printing low-cost electronic tattoos on human skin isn’t a new one, however its potential for use in a number of military applications is a relatively cutting-edge proposal. A team of scientists from the University of Minnesota utilized a custom 3D printer to print electronics on human hands, which researchers believe could be utilized by soldiers as temporary electronic sensors capable of snuffing out chemical or biological agents. Circuit designs are able to be 3D printed onto skin thanks to an ink made from silver flakes which can cure at room temperature, keeping the transfer process safe and the skin safe from burning. After use, the 3D printed electronic tattoo cam simply be washed or peeled off.